The logistics of this race require some additional planning to be sure to best use your time. In the past, I have taken the Friday off prior to this race, but I could not do that this year. During my lunch break, I headed downtown to the Convention Center for packet pick-up. Since it opened at noon, there were plenty of other people that had the same idea. Several of us had planned to meet up and I only ended up seeing a few folks. Getting through pick-up took longer than it has for me in the past. I hit the IM store for some shopping and spent some money in NO TIME! I had a couple of minutes left for some pictures, but some people in our group had already left to go back to work and some were still in line, so the planned group pic didn’t happen. Bill was ready for his first 70.3! 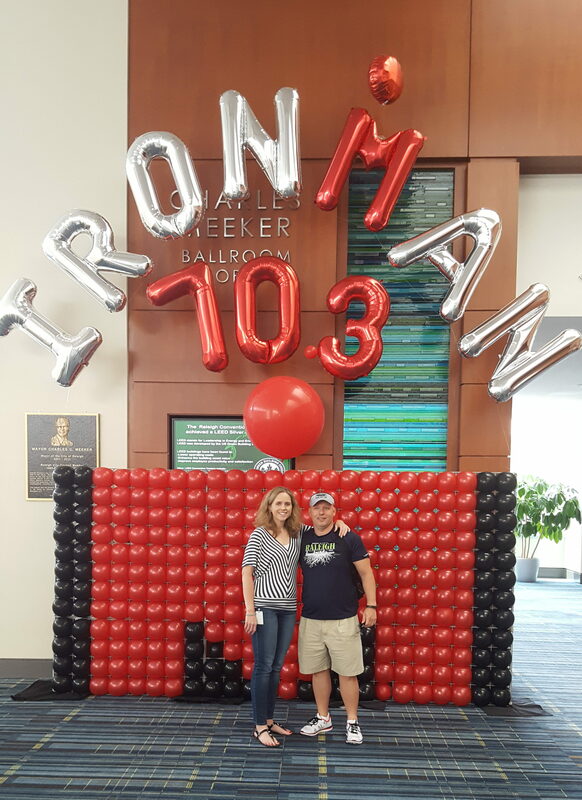 Tarina has had many road blocks, but has worked so hard for her first 70.3! Saturday morning was low key. I prepared homemade blueberry pancakes to kick-off my pre-race day eats on the right foot. While I was cooking, Tony was putting the last minute touches on my bike. After breakfast there was lots of chatting and texting with some of my teammates about preparation, meeting up for bike check, etc. The morning flew by and before I knew it, we were eating lunch. I met up with two of my training partners for check in. It went smoothly. We checked out the lake and the swim buoys …all looked good. We arrived home and I completed all my race prep while Tony started cooking a pasta dinner. After dinner we actually watched 2015 IM World Championship coverage from Kona to get in the race spirit and then got into bed at a decent time. Unfortunately, it took me a very long time to fall asleep (which is not usual) and before I knew it, the 3:30am alarm sounded. Back to the logistics of the day, I needed to be downtown at T2 in order to catch a shuttle that would take us out to the swim start (about 40 minutes away). Several of the team members arranged to meet at 4:45am in order to ride over together. Tony was a real trooper and got up with me, had breakfast and then dropped me off. What a supporter! The road to the swim start is closed to traffic therefore, any spectator wishing to go out to Jordan Lake, must also take a shuttle. However, they are not shuttled back until the last swimmer is out of the lake and has progressed out onto the bike course. Tony and I had agreed that I would see him on the run. Trying to navigate the bike course for spectating can be challenging with traffic backed up and at least one road closure. It is a lot to deal with for a quick glimpse. I knew I wanted him to be out on the run….that is where he could provide me the support I would need. Like last year, he took out his mountain bike in order to maneuver quickly to various spectating spots. The line for the shuttle went quickly and several of us from the team were on the same shuttle. The ride out went extremely quickly. We arrived around 5:45am….plenty of time for final preparations until T1 closed at 6:45am (pro start at 7:00am and my wave started at 7:56am). The swim was definitely not wet suit legal. The four years that this race has taken place, the first two were wetsuit and last two not. Last years’ race was actually May 31 and when the date for this years’ event was announced as June 5, I figured it would most likely be over the 76.1 degree mark. I was feeling good as the swim began. I had a huge goal for myself which was to really work on sighting and trying my BEST to maintain as straight a line fairly close to the buoys. This is a big weakness of mine and I knew that IM would have lots of buoys which obviously makes it easier to sight. As the swim started out from shore, things were going well. I did not have a lot of contact and I continued to see yellow caps around. I was able to get in a draft for a short time once or twice….something else that I need to work on. The right turn at the first buoy was a game changer. Within a matter of seconds, I felt the chop and waves change completely….for the worse. This was status quo for this long stretch of the swim. I also felt like I was being pushed out from the buoys close to the support kayaks. I continued to stay focused on the sight buoys. There was more contact with other swimmers on this stretch. I also saw a some back stroking, which is not unusual. As the chop continued, I just maintained course as best I could and fought on. The next right turn would be the one to lead up into shore. I was so hopeful that the chop would settle some and we would have a kinder last leg. My wish did not come true. It might have even been worse going in. I don’t know….I was focused on the shore and finishing. As I ran out of the swim, I lapped my Garmin and my time of 52 mins showed. Instant disappointment. This was my slowest Raleigh 70.3 time. I had planned for better execution. I was happy to be running out about 10 steps behind one of my friends that is a stronger swimmer than me. That really surprised me. I swam the entire swim and did not stop along the way. I felt like despite the crappy conditions, I stayed strong and consistent as I could. So, what I didn’t realize is that these conditions had really proven to challenge more than just me. Apparently there were people everyone stopping for breaks with support crew and people that were being asked to be taken to shore. Also, there were folks that I know that did not make the swim cut-off that would normally never have any problem doing so. Jordan Lake was no one’s friend on Sunday. My huge personal accomplishment related to my swim for the day was that I ended up as rank 49 out of 121. This would put me as top 40% versus bottom 40% from last year (93/151). I am always looking for the indication of personal improvement at an event. While a better time is always great, it can be tough to compare a race from one year to the next due to differing conditions, true distances, or other variables. While the age group field is also different from one race to another, I think it can be helpful as everyone that is racing that one particular day are all dealing with the exact same conditions that the day brings. Also, when I looked at my Garmin stats post-race, my GPS track on the swim was fairly straight. Two personal victories! On a side note, Tony was actively tracking me. He knew that I would not be happy with my swim time when I saw my Garmin when I exited the water. However, he knew that my overall placement coming out of the water was much better than where I typically am, which would be good news. He called my mom who was waiting to see me around mile 6ish of the bike and asked her to try to communicate to me that I should be happy with my swim. He had correctly predicted that I would be thinking about it as I progressed on my bike. Nothing too interesting to report. Honestly, I was feeling a bit bummed. I did my thing which include a thorough spray of sunscreen. The distance from my rack spot to the bike mount was far. The first 5-6ish miles of the ride are not pleasant. The road is not smooth and there is an additional out and back section which is tacked onto the ride out from the lake to the main road. There are clusters of people and it is not easy to get into any kind of rhythm at this point. My approach each time I had done this race is to focus on (1). drinking and (2). eating. I did just that. At the end of the lake access road is where my mom always hangs out during the race. 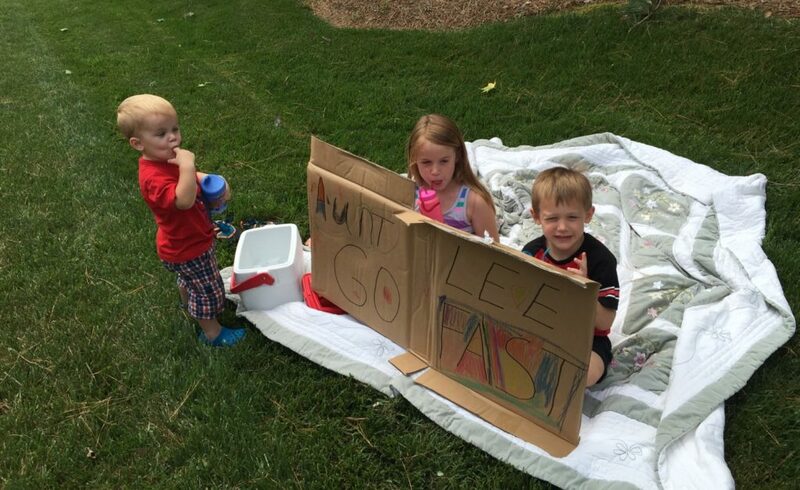 This is just a matter of a few miles from her house, so it is super convenient place for her to cheer! I yelled to her and she cheered and then I heard….”blah blah blah blah SWIM….”. 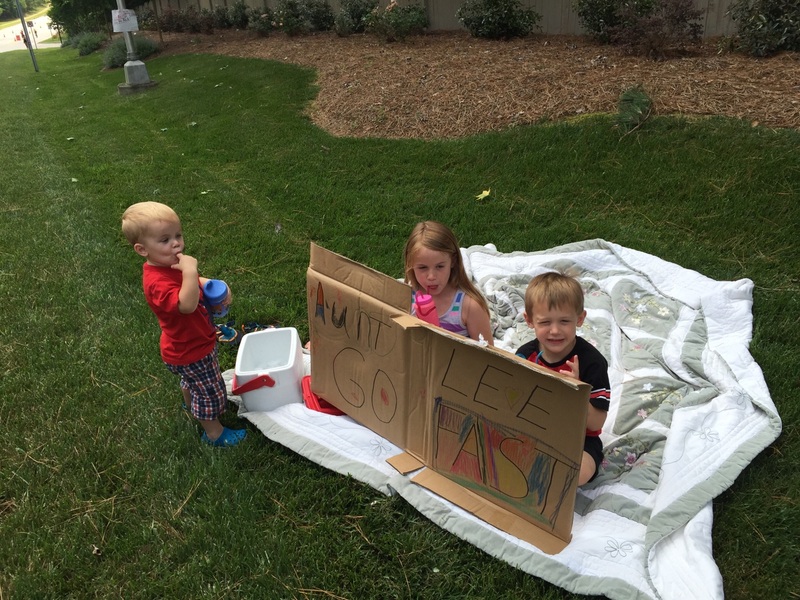 Then more cheers….GO GO GO LEE!!! What? Did I hear her say something about my swim? Little did I know that she was trying to send me a message at the time!!!! Love her for trying!!! As soon as that turn is made off the road that accesses the lake, the real riding begins. This stretch of road is flat is smooth. Great, great, great! This is the first place where you can really fall into aero and get a solid rhythm. My goal was to ride by feel…push where I thought it was smart to and ride easy where it made the most sense. While I was drinking just fine, I did not have the feeling that I wanted to eat. I had a larger than normal portion of oatmeal for breakfast at home around 4am and then I have ¾ of a PBJ around 7am before the swim. I wanted to start with the Bonk Breaker (I typically can only eat those early on during a hot ride) and then switch to normal option of waffles and throw in some goldfish for a change of taste. I also had the chews if I felt like I wanted them. I had about half of the Bonk Breaker early and then the next time I ate, it was part of the waffle. Overall, the idea of food was just not appealing to me. I didn’t feel bad at all, just uninterested. However, I knew it was important to get in the calories!! I was feeling good and felt like my pacing was spot on. I was not feeling hot and took fresh hydration at each available station. I did check my average speed a couple of times, but I didn’t want to focus on it too much…just continue on by feel. Around the 44 mile mark, the bike course goes along a road that my brother and his family live off of, as well as, one of my closest friends. I was on the lookout for them, but I was not certain that everyone would be out. I saw my brother and his three kids along with an awesome poster!! Could not ask for more adorable cheerleaders! They make me a new sign every year! Very shortly thereafter, Kelly and Sean spotted me at about the same time I saw them! So awesome to see everyone out just to support me! The last 12 miles of the bike continued on really well. My legs felt good and I felt like I had been riding smart. 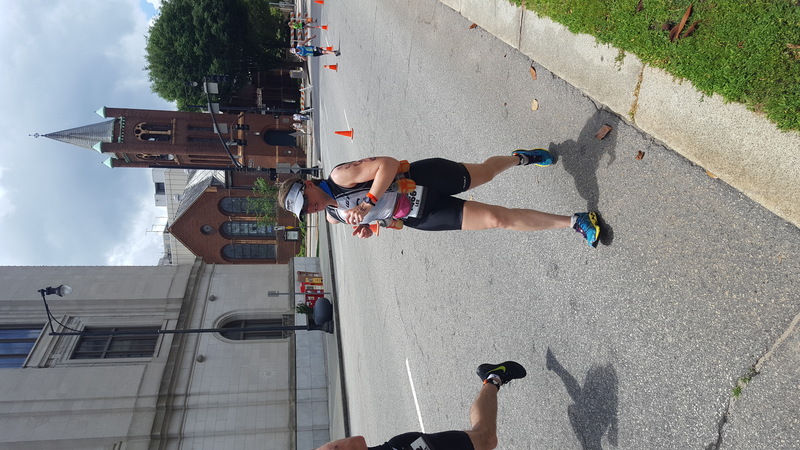 I continued to drink and the eating was not quite where I wanted, because I was still not wanting to eat, but I ate ok. As I neared T2, I felt confident with a new PR and was feeling as ready as I could to start the run. The dismount off the bike and run into T2 was not a short stretch. I thought about leaving my shoes on the bike, but was concerned about how hot the pavement would be. It was not a pleasant run in bike shoes, but did ok. It was much better than my T2 fiasco from 2015! 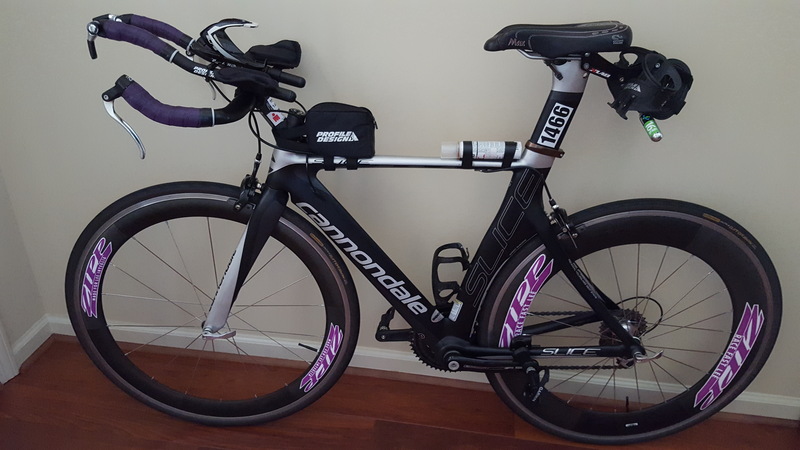 I changed shoes and grabbed my visor, race belt and hydration belt from my soft sided cooler in the transition bag. I was certain to generously spray the sunscreen. Stopped for a bathroom break and I was on my way! Big smile when I passed some friends as I ran out of T2. Friends on the race course are the best! Right away, my stomach felt off. It felt ick! WHY??? Who knows!! As I was running, I just didn’t have the umph to push. I didn’t know what to expect during this half marathon. I saw Tony right away and he was saying that I looked good. I just wish I felt better! Very soon after I saw my good friends Tim and Nicole. They are awesome supporters and tend to choose great words to help motivate. Like he did last year, Tony brought down his mountain bike so he could get around on the course easily. That ended up being a great plan for him and I think it made the spectating more fun from his perspective. This race is definitely a journey of aid station to aid station. 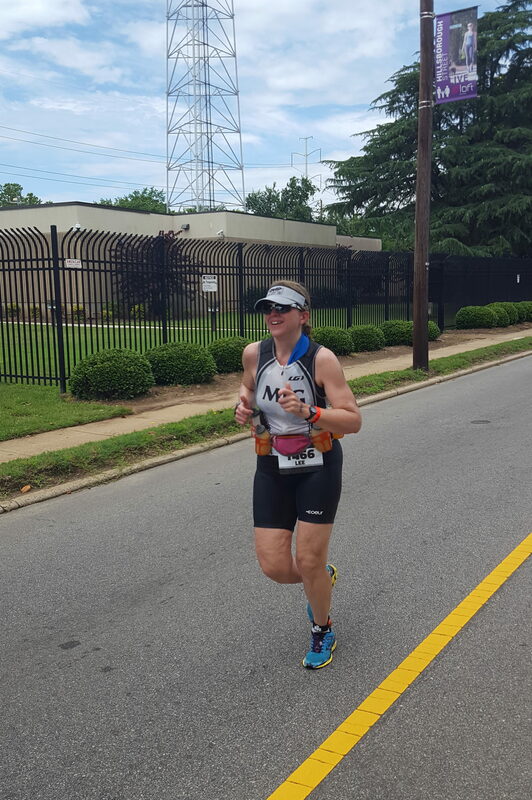 I was wearing a hydration belt of Gatorade Endurance and I had goldfish and Honey Stinger chews, so that allowed me really focus on the cooling aspect at the aid stations…ice in the sports bra, water over the head and shoulders and some for drinking. I will say that from the four times this race has taken place (I raced three of those and volunteered at a run aid station the other), this year stood out as having fabulously stocked aid stations (ICE EVERYWHERE and more cold sponges than ever). As I continued on my first loop, my stomach stayed about the same. Didn’t get worse, but not better either. It was just off. It was great seeing lots of others from the team. Having strong people out there that you train with that are enduring the same tough conditions makes a difference. I walked more than I ever wanted to during a race. I am always open to walking the aid stations in order to get everything you need, but always plan to run otherwise. I needed more breaks, but tried to get them as short as possible. As I was nearing the end of the first loop, Tony asked how I was doing. When I told him “about the same”, he asked if I had taken Coke. NO! It simply had not crossed my mind, since I was focused on staying as cool as possible. I took it as soon as I could. The end of the first lap goes down close to the finish line and loops around to start the second lap. During this section I passed the cheering section for the team and they were out and loud with lots of high fives! LOVE THAT!! I saw Tony again and Tim and Nicole. They all continued to tell me that I was looking strong…they are so sweet…I wish I felt strong! Within 10 minutes or so from taking the Coke, my stomach started feeling better. GOOD! I took it at every aid station thereafter and I was so glad Tony had suggested it. The second lap still was not great, but more consistency in the run than before the Coke. It was hot with really no relief from the sun, but I continued to focus on cooling myself regularly. I continued to see teammates which is a big boost. Everyone was working so hard and giving it their all. What awesome people I get to train with!! As I hit the last mile, I was just so focused on finishing. I was so ready for that chute…I remember it so well from previous races and it is GREAT! As I turned onto Fayetteville Street and followed the arrows to the right side (the left side is for the start of the second loop), I was relieved. 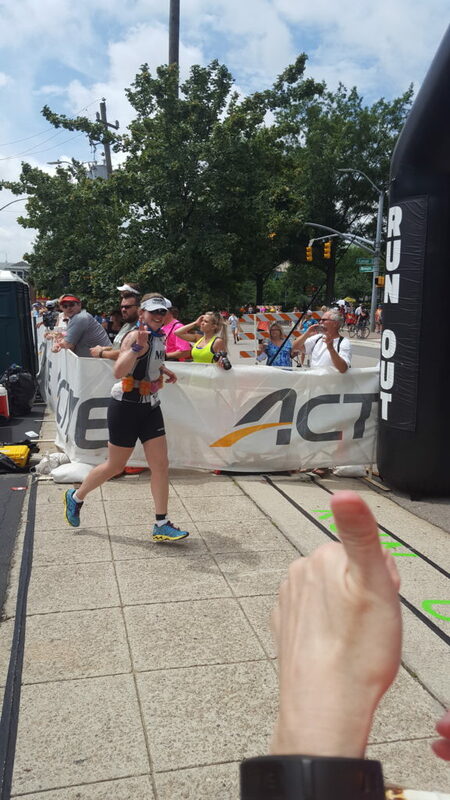 I finished strong and savored that awesome feeling of crossing the finish line. I love that feeling of giving your all and the pride for your accomplishment. I received my medal, finishers’ hat and considered any food that might appeal to me (nothing really). I quickly saw Tony, Tim and Nicole and met them at the fencing. 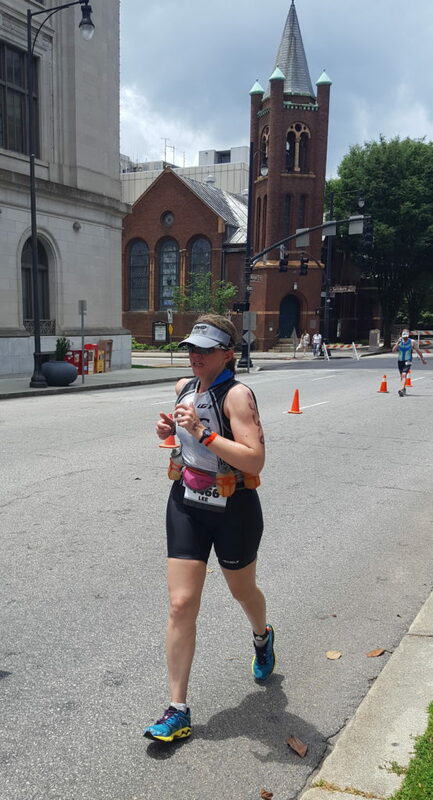 I was thrilled that my fourth 70.3 distance was done! Post race is always fun. Beaming from the excitement and chatting about everything that happened. I knew that Bill and Matt, whom I have spent most of my training time with this season, would be finishing soon, so I was on the lookout. This was their first 70.3. 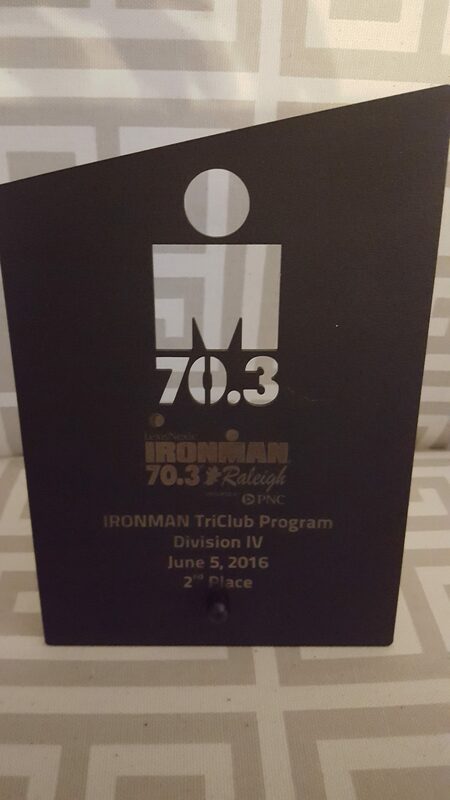 Also, another close friend of mine was racing in her first 70.3, so I wanted to bet there when she finished. Fortunately, I was able to pair up with the guys after they finished. I totally missed my friend Tarina, but we caught up about 30 minutes after she finished for a big sweaty hug. 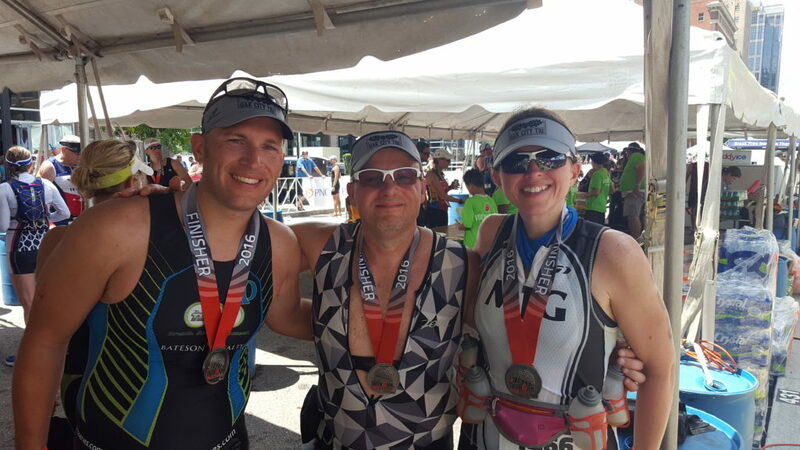 I could not have been any more proud of my friends that completed their goal of finishing their first 70.3. What a tough day, but they DID IT!!! The team had a post-race cookout. 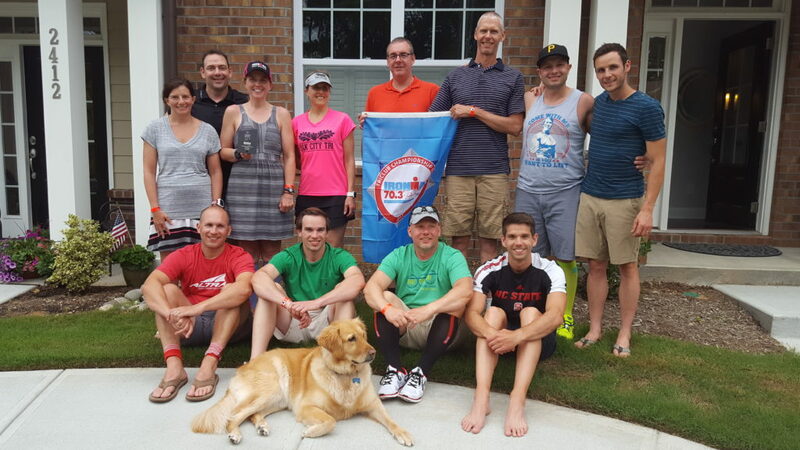 During the cookout, we learned that our team, Oak City Tri, took second place in our team division overall. How cool! We are a new team….we don’t even have our team kits yet. Our visors and t-shirts were completed prior to race day, but we are still a few more weeks out for the kits. Very exciting! Part of our team, Oak City Tri. Some of us raced and the other were awesome supporters! I had a very attainable goal heading into this race. Even though every race is different, from my experience at this race and training this season, this is something I was aiming for. Unfortunately, I did not hit my goal. There are some things that I am especially proud of though. 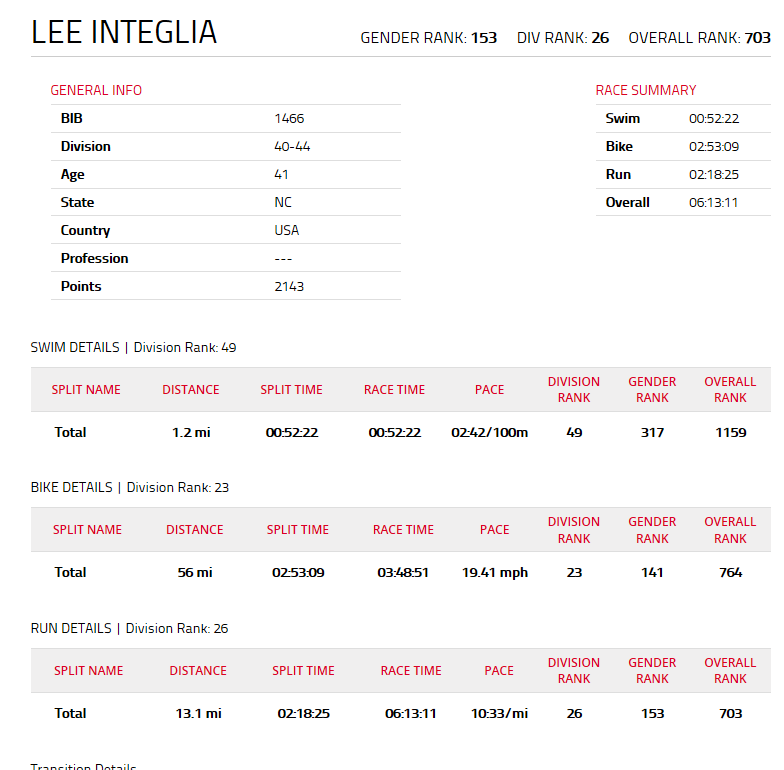 While my overall, swim and run times were not better than last, my age group placements did improve. I was also able to secure a new PR on the bike! Probably like most, I do a lot of reflection after a race. I think about the things that went well and the things that I hoped would go better. But, I don’t have regrets. You make decisions over the day and you can’t second guess them days after. 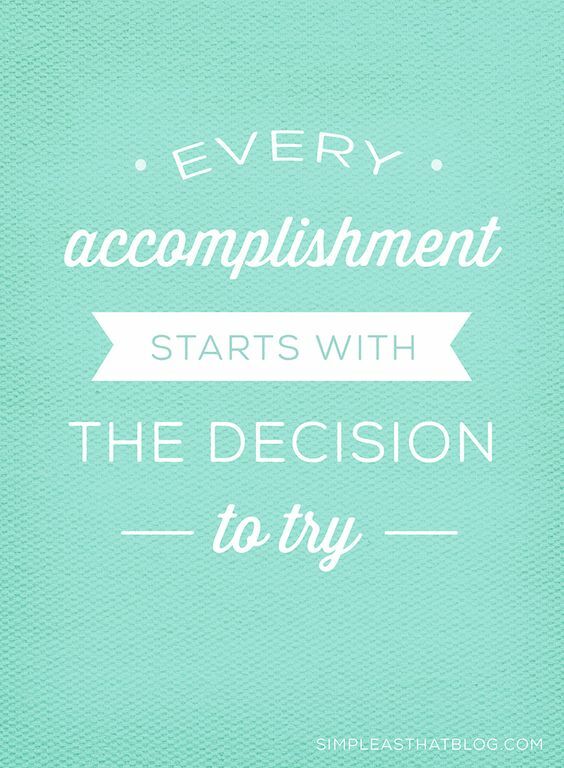 Those decisions are often made when you are feeling great or feeling low, but you have to have faith that you made the best decision you could at the time. I am proud of my day. I am also thankful that I am able to participate in this amazing sport and that I strive for big goals and continue to challenge myself in this way. I am so incredibly lucky to have had the support from family and friends that I had that day. SO AWESOME! 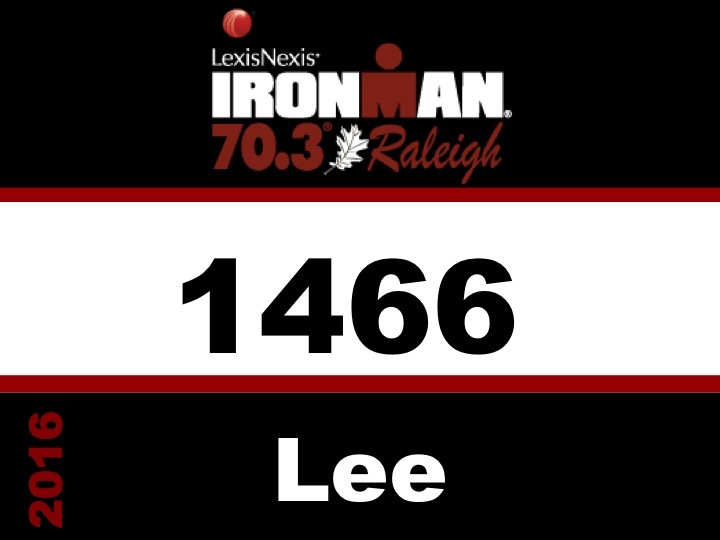 I vividly recall during my run at the 2015 IM 70.3 Raleigh when I decided that I would not do this race in 2016. 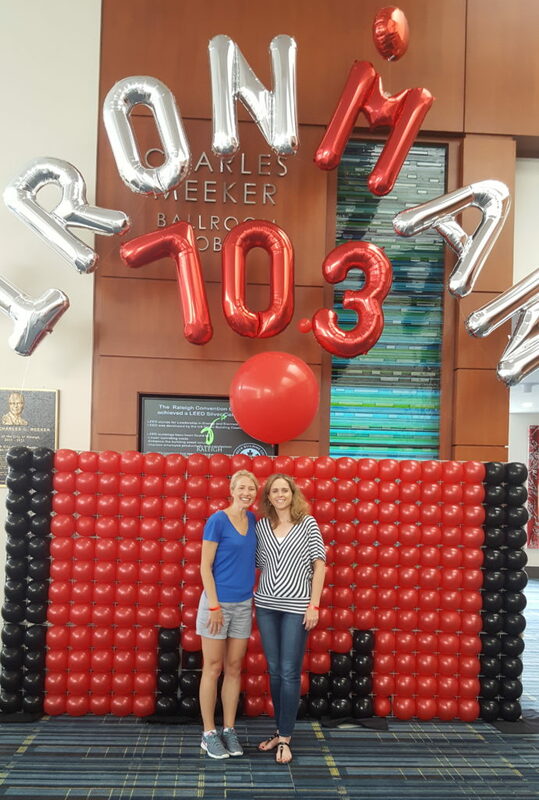 Well, fast forward one year and I am upon my third start at Raleigh. 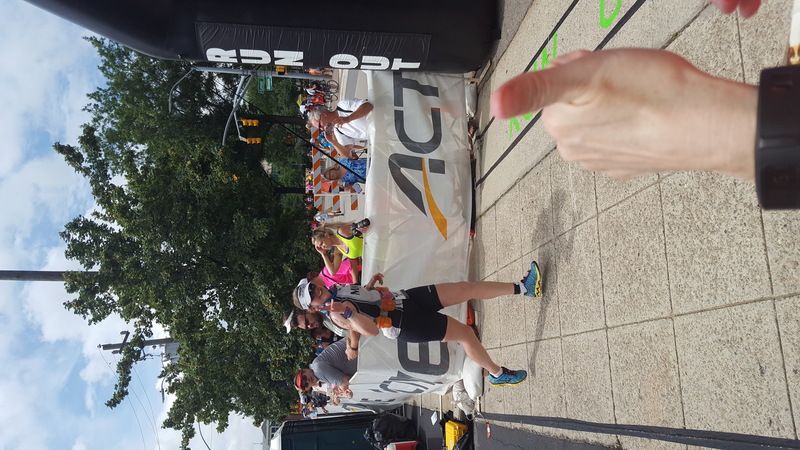 The decision “made” in 2015 was in the midst of a very challenging part of my race…the run. The heat has always been a tremendous factor at this race….specifically during the run. This year looks to bring very similar weather conditions, so I am very familiar with what to expect. It certainly won’t make it any easier, but I know the EXTREME challenge it can be. This will be my fourth 70.3 distance race. My very first half iron distance was Beach 2 Battleship (now Ironman 70.3 NC) in 2012. That race was my time PR for this distance at 5:53:43. However, that course is a fast and flat with a current assisted swim. The weather that day in October was also a beautiful 70-something degrees. 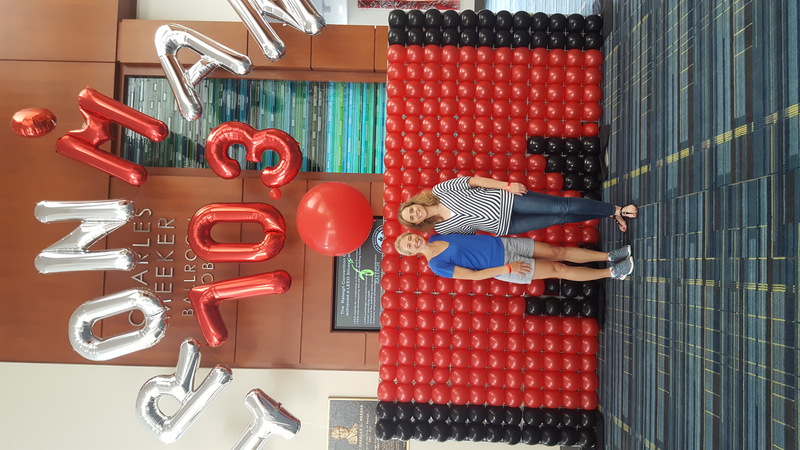 Raleigh 70.3 is a far more challenging course and historically tougher race conditions with heat and humidity that Mother Nature has not given us time to acclimate to prior to the race. 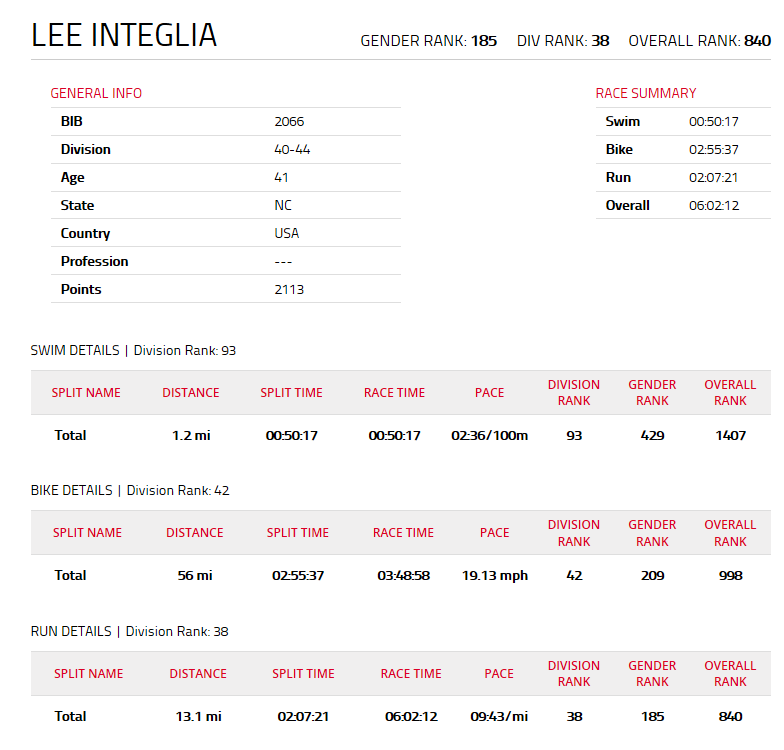 One of my big goals for Raleigh 70.3 last year was a sub-6 hour finish. My finish time was 6:02:12. While this was my best Raleigh time (plus the first year it had not been wet suit legal), you can say that I have some unfinished business on this course. I have trained hard this year. I feel I have also trained smart this year. On Sunday, I want to combine the two and go for my goal. With the heat, I know it is super important to listen to my body and respond appropriately. That is the most important thing…the forecast shows a very tough day! But hopefully the day will be a good one for me and all my dedicated efforts pay off!